Arabdemocracy: The Cedar Island: A Lebanese "Truman Show"
It has been confirmed. 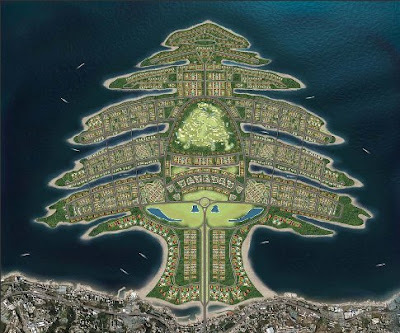 Noor International Holding unveiled last week its plan to build an artificial "Cedar Island" off the Lebanese coast, in the Damour area. The Cedar Island has even a website, with pictures strongly reminding us of Dubai’s "Palm Island". Noor International Holding presents itself on the website as a company "specialized in real estate development, who acquired experience after developing since 1994 more than 12 projects in the Middle East and the Gulf region". But their "vision" goes even further as it aims to "(…)transform the virgin land into a blossoming productive community scoring a distinctive benchmark". This sentence is in my opinion more important than the project itself. It is the best starting point to think about the project before looking at how it has been perceived by the public so far. Transforming the virgin land may be an accurate terminology to describe the process that has been taking place on the sands of the Emirates to boost development and employment. It has been equally accurate on other occasions throughout History. In the United States for example, large arid areas were transformed in the late 19th and early 20th century with the expansion of the industrial revolution to the rural and impoverished regions. This is how many American cities developed and flourished: First with the expansion of the railway network, then around industrial metallurgic factories, and later on around oil fields. In these two examples, it is relevant to talk about virgin undeveloped areas where big investments and projects are the only way to prosperity. But Lebanon unfortunately lost its virginity a long time ago, and there are no more virgin areas in the land of the cedars. Lebanon can be described today as the anti-model of good urbanism. The construction process was extremely chaotic even before the civil war (1975-1990), only getting worse during the years of conflict and has never really recovered since. The law in Lebanon is often a tool in the hands of the entrepreneurs, who are usually well connected to the circles of power, when they are not already in it. It is useful here to remind ourselves that in the mid nineties, MP Michel Murr changed the law for just 24 hours in order to issue a clearance for his company to build two residential towers named "Cap sur Ville". This was in an area where building was and now is again limited to five-storey. Lebanon is a country experiencing an advanced stage of clientelism. In that sense, building the Cedar Island will set a dangerous judicial precedent and pave the way to other similar grand projects. It somehow looks there is a trend to build ghettos for rich people, while the need is to invest in the organization of the human, environmental and urban Lebanese chaos. However, mainstream Lebanese opinion seem uninterested in the latter, as is revealed from a quick search on Facebook, the pro cedar island groups exceed 13 thousand supporters, while the anti barely reach 3 thousand. These figures are very revealing of the current Lebanese mentality and the direction in which the country might be heading in the near future. Of course, Noor’s project will need to pass the parliamentary, governmental and presidential test to become a reality, but the Island, according to Noor Intl, has already received the blessing of Lebanese Tourism Mnister Elie Marouni. It will only be a matter of time before the creation of the Lebanese “Truman Show” begins: An unnecessary excess built on the ruins of our natural environment, and surrounded by rings of chaos and poverty. In the age of the Resistance, this visionary project will still be exposed to the madness of the Israeli Air Force. If and when D day strikes again, the F-16s will destroy our fake cedar after allowing its A-List population to flee in luxurious yachts. شكرا بشير على إثارتك لهذه القضية. الشاطئ البناني منذ سنوات طويلة مستباح بشكل كامل من الغالبية الساحقة من السياسيين في هذا البلد، والتعديات على الأملاك البحرية لوحدها التي وراؤها سياسيون من 14 اذار ومن 8 اذار معروفون كلهم لا احد يتحرك لعلاجها أو لقمعها مع انها على المستوى المالي على الاقل تدر الى المال لعام ميلارات الدولارات. حاولت حكومة الرئيس سليم الحص السابقة اثارة الوضوع فجوبهت من وزراء داخلها قبل الخارج ومن الجهاز الامني السوري ومن المعارضة آنذاك من رئيس المجلس النيابي، ذلك لان استباحة الشاطئ اللبناني قد تكون احدى الامور القليلة المشتركة بين السياسيين في لبنان. هذا من جانب، من جانب اخر لا احد يسأل عن الجانب الحقوقي والبيئي للموضوع، فالشاطئ هو حق من حقوق المواطن لا يمكن حرمان اي مواطن من الاستفادة من الواجه البحرية ومن التمتع الشاطىء. وحسنا فعلت بالحديث عن النظام الزبائني حيث يدوس السياسيون جميعا هذ المفهوم، ولا يكتفون بحرمان اللبناني من الشاطئ بل تصل تعدياتهم الى شفط رمول البحر كما حصل في صور مثلا برعاية رئيس مجلس النواب، أو عبر التعدي على التراث التاريخي والطبيعي في شاطىء أنفه في التسعينيات لحساب نائب رئيس مجلس النواب الحالي وغيرها من الأمثلة. وكما سبق وذكرت يا بشير في لبنان يعدّل القانون لمرة واحدة واستثنائية ولمدة 24 ساعة بهدف ارتكاب تعدّ على الحق العام، هذا ما فعله المرّ وغير المر أيضاً والأمثلة كثيرة. وفي مقابل كل هذا تقف الجمعيات البيئية شبه صامتة ما خلا ناشطين قلائل لتشير ايضا الى أن المشكلة ليست قط في النظام السياسي بل في صلب المجتمع الاهلي الذي يبدو أنه لم يعد يتحرك بالشكل الكافي للدفاع عن مصالح الناس. Thx for your comments. Wael, you're so right about both the environmental and the political arguments. Unfortunately, the damage done to the environment in Lebanon is massive enough to write an entire encyclopedia. And as you said, the real problem is in our society, and our political leaders and system became nothing but a mirror reflecting how our civil society became “uncivil” by adopting clientelism as a culture. So, how to break that deadlock while our population is massively CONVERTED to corruption? This is the real question that might have a theoretical answer, but not a practical one for the moment. I get here to Booter’s comment to say that it s not a change in the regional map that can change our corrupted culture. It is partly in changing the internal balance of power, but not in the interest of the existing forces rather than by creating a new political frame injecting a real anti corruption culture in our society. Does it seem that impossible? My answer is that it might take a long time and hard work, but it is possible! Nice article. Interestingly, it coincides with the publication of a study on the landscape of poverty in Lebanon. According to this study, 3% of the Lebanese are what you might call filthy rich (they'd be filthy if it weren't for all the cosmetics and plastic surgery they perform), while almost 50% cannot staisfy their basic needs (Food, power supply, education, and health). I think if this island is built, it will change the whole environment of a country that once had a beautiful nature. I just keep wondering why the Lebanese do not like their country, they keep burning its trees, drying its rivers and creating thilthy beaches. Lebanon has a serious environmental problem, but ofoucurse the Government and Politicians are in a deep comma.